Been working on improving my lathe skills. This is a Sassafras cup? that I turned, it actually came out better than the photos look, I don’t know what those white looking spots around the top are – they aren’t on the actual piece. Not perfect, but I can see some improvement – this is my first hollowed vessel. Absolutely awesome work. love the wood. Great work. Practice makes perfect especially when your having fun. Hello cajunpen, for a first you’ve done well Congratulation, but take care to spend a little more time finishing the inside a bit better, try to remove the tool marks as shown on the pic. Nice, the grain makes it look wonderful, well done. Bill how big are the turnings? I’ve got some 1” sasafrass and some 2” Atlantic White Cedar. It should turn easily. Karson, the Sassafras cup is from a piece of 4”x 6” wood that I picked up in Arkansas several years ago. The finished project is about 2 1/2” x 3”. It was fun turning – not perfect, but a learning experience. My main problem is that I don’t have very much stock large enough to turn. I turned a bowl today, but had to glue up some Fir to make the blank. Bill: I don’t know if you’ve seen Scott's small turnings I sent him a couple pieces of wood and he sent me a couple of the small Christmas ornaments. 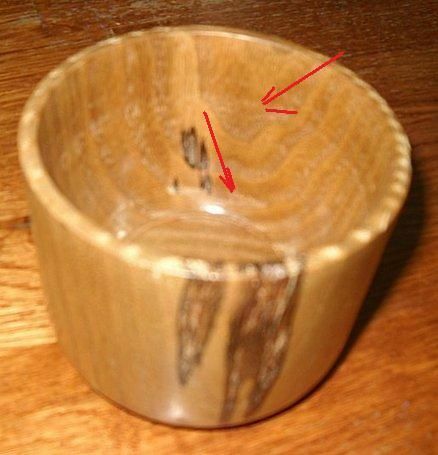 He also made them as small bowls. He called them mini Ice Cream bowls. They are less than 3/4 ” and maybe 2” diam. They are cool. Specially the ones that he glues a strip across the 2 layers. Oh, I’ll bet that was some nice aroma in the shop. Karson, thanks for the link – I have seen Scott’s work before and admired it – thanks for reminding me, I have a 3/4” inch glue up in mind for a square platter/plate. Hopefully it comes out good enough to post. Bill, every turning you do gets a little better, but isn’t that the way it is supposed to happen? LOL! !